Just in time to ruin your holiday cheer, Belgian quintet Marginal come storming into the party like your drunk Uncle Randy after one too many glasses of rum and eggnog. Formed in 2013 by veterans of other Belgian acts Aguardente, Bark, and Aborted, this unkempt troupe seeks to combine grindcore and crust whilst paying homage to the early days of Napalm Death, Extreme Noise Terror, and Discharge. If nothing else they’ve certainly been prolific in doing so, releasing debut The Venom in 2014 and sophomore album Chaos and Anarchy just a year later. 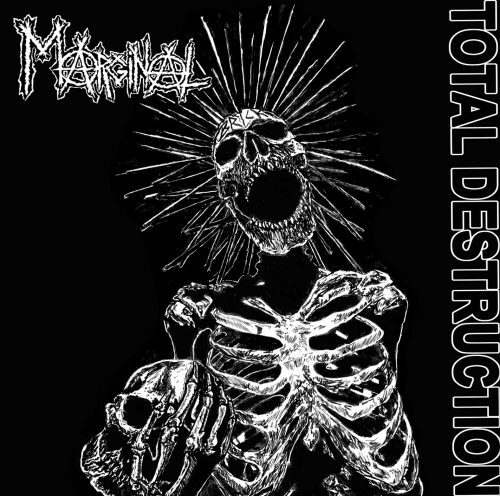 With third full-length, Total Destruction, will Marginal continue to rock against “the Man” as hard as that skeleton with liberty spikes on the cover? Yes, and the result is a fun little crust record that wears its influences proudly on its patch-adorned sleeve. Drums consist mainly of D-beats and quick hammering rhythms, song lengths rarely exceed three minutes, and verses are comprised mostly of simple rushing riffs whose chords are then re-shuffled for the chorus. Everything is then wrapped together in a surprisingly clear production job whose focal point is the vibrant and buzzy guitar tone. 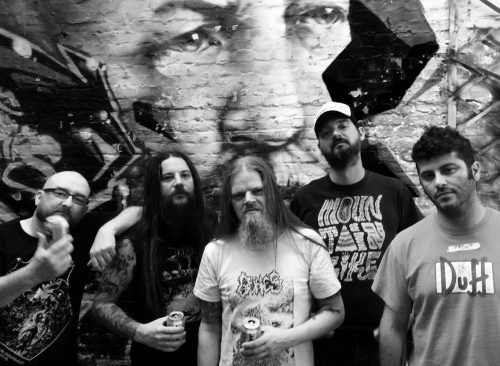 Though Marginal claim a grind influence, blastbeats are practically non-existent, and only a few of the riffs have the frenetic character one would expect from a grindcore act. At heart, Destruction is a crust record, not unlike a more brutal version of Parasit or Wolfbrigade, with both a heavier overall sound and a vocalist whose rasps are more guttural than either of those two. Opener “Barbarians” shows this from the outset, barreling forward on blunt chords and a refrain that consists solely of a roar of the track title. While this largely remains the framework for the rest of these 27 minutes, some odd squawking notes in the song’s bridge provide an early hint that Marginal aren’t entirely afraid to color outside the lines. Follow-up “Delirium Tremens” works in some terrific churning tremolos, while “Fucked Up Society” features a bobbing main riff whose open notes provide a welcome dose of melody late in the runtime. The real standout, however, is fourth track “Impaled,” whose verses are built off a quick and immense chug that recalls both Armoured Angel and the title track of Power Trip’s newest record. Coupled with some screechy background vocals, it’s a powerful early cut that rumbles forward like a tank with chainsaws welded to the front. In true crust fashion, the band recorded Destruction off-the-cuff, with only a few skeletal ideas mapped out before entering the studio. Sadly it seems this choice may have been more of a detriment than a boon. Most of these 12 tracks are quite repetitive, with simple choruses that are repeated far too often for songs that average only two minutes in length. Things get predictable fast, and it doesn’t help that tracks like “Ruination” and “The Violent Way” feel like Crust 101 for much of their runtime. As a final quibble, “Atom Sapiens” and “Total Destruction” both feature portions of the most overused sample in all of metal (that is, J. Robert Oppenheimer’s “Now I am become death…” speech), and it doesn’t even feel that effective in its employment. Fortunately, as heard with the slow ringing chords of “Rat Kebab” or the thrashy verses of “Leech Invader,” the band still manage to infuse some variety into the proceedings. Likewise closer “Total Destruction” ends things on a potent note, riding on a menacing chug before cresting with some twisted tremolos. In all Destruction isn’t the type of album that’s going to establish Marginal as new stylistic torchbearers, but it certainly is a raw and earnest good time that’ll make the perfect soundtrack to crushing a few beers in the basement while everyone else is upstairs singing Christmas carols. Besides, didn’t your parents tell you to eat your crust?